Every so often, I get restless. Ok, well, I get restless a lot. I am goal oriented to a fault and need something on the horizon to keep me pushing, striving. I knew I had nothing on the calendar after the Lutsen 99er, and I knew that was trouble. I scoured the internet for suitable events and races that matched my kiddo schedule to no avail. Then, my ex asked if he could take our son out of town for an entire weekend less than two weeks away, and my mind started churning … what would I do with a whole weekend off?! My boyfriend made the mistake of goading me into riding across Iowa in a day, telling me I needed to find other riders and plan a route, and he’d make sure we had transportation covered. I’m not sure he realized that once the gauntlet has been thrown down, I won’t give up on something! 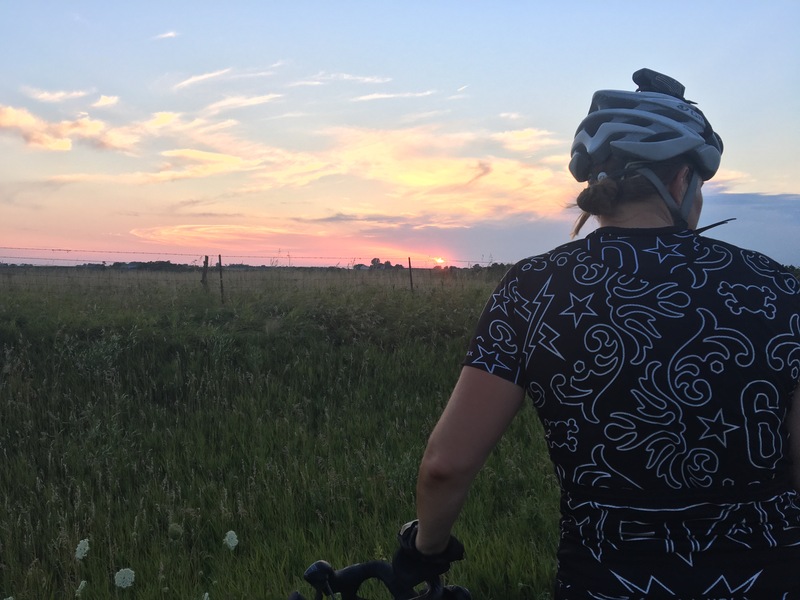 I recruited riders to who wanted to go do something “stupid”, telling them I would take care of transportation logistics, lodging, and a route — all they needed to do was be willing to pedal their bicycles all day and maybe all night. My two friends Leah and Pamela rallied and said they were IN! 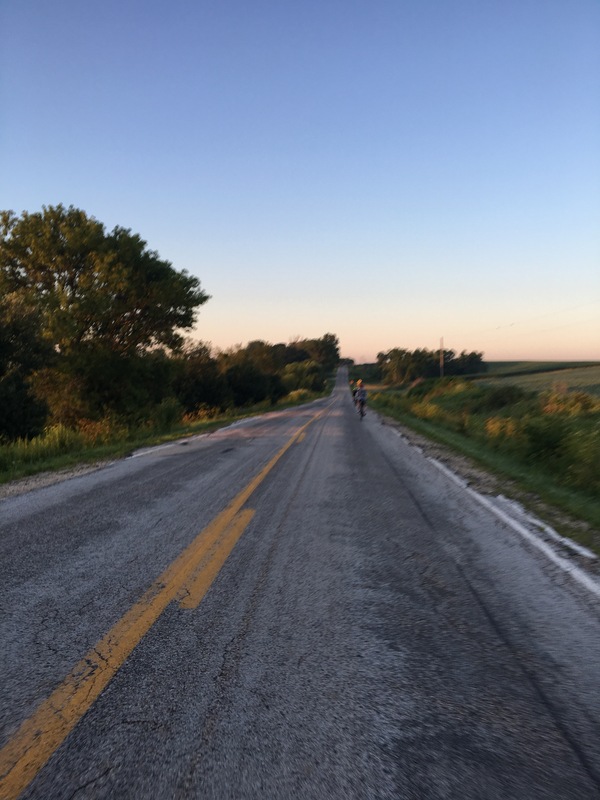 We were the three women who started the Alexander 380 together this year, and I was the one who was on the course the shortest amount of time @ 165 miles and 18 hours, so I knew I would be riding with very capable women for my cross-Iowa attempt! I went from zero plan to an amazing plan in about a week and a half. I carefully reviewed county pavement and traffic maps for Iowa, selecting our route to try and simultaneously minimize miles and avoid the onslaught of traffic. I spent countless hours on that route (15? 20? ), my perfectionist nature taking over the week before the ride. However, in hindsight, I regret nothing in terms of the quantity of detailed planning I did. I have good friends who live in Decorah who recently converted their basement into an Air BnB listing. I asked – could we stay there the night before and the night after the ride? and they said sure. 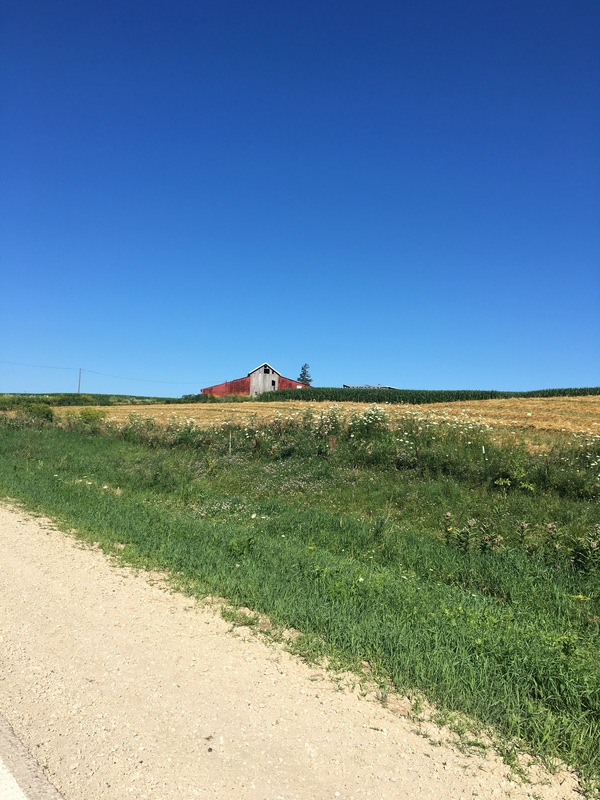 (This is a shameless plug for their place – if you live in the area and want to bike the driftless area on a mini vacation, GO THERE! I’ll even provide route suggestions. Gravel? Yup. Pavement? Yup. MTB? Yup.) We three ladies drove down to Iowa together the night before our big ride, laughing at the absurdity of our plans. We settled in for the night, got bikes ready, and managed to get a few hours of sleep before our 3:15 wake up call. 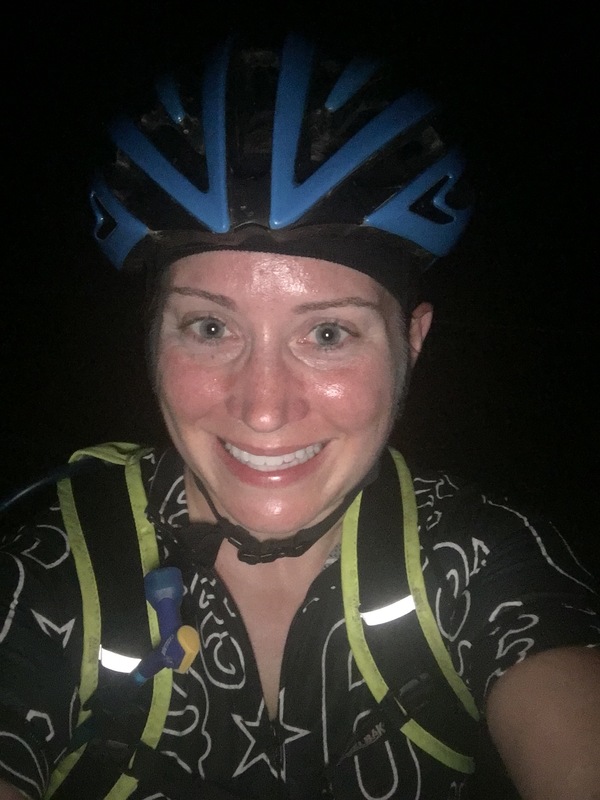 We rolled out early in the darkness, loading bikes and piling into the car and drove 30 minutes north into Minnesota, wanting to make this a legitimate trip across ALL of Iowa. We parked in Canton, MN and did final assembly on our rigs in the pre-dawn light. I fired up my Garmin, which housed my carefully planned route, and began to feel a sense of dread when it kept stalling while loading the route. We took a few pictures in the dim light, and I returned to the computer and saw it was still not working. I reset it and reset it again, only to have it continue to crash and do odd things. We slowly began rolling as I fumbled with the device. I glanced up and was shocked to see a SKUNK very near on the shoulder of the road, tail lifted in my direction. HOLY CRAP, I thought as I swerved erratically, I do NOT need to get sprayed by a skunk at 5-something AM before a day long bike ride. The Garmin eventually kind of loaded the route, mostly letting me know when turns were approaching. Good enough! One of my major regrets from the Alexander was not taking enough pictures. At the time I thought I’d be on course for a second sunrise, and my nerves were too high to focus on taking pictures. This trip, I made a point to take in the beautiful sunrise, fog melting off in the valleys, and general calm of the early morning hours. This was the second time I had ridden through a sunrise and it was breathtaking. We rolled up and down the hills into Decorah, already running a little behind schedule. As we entered town, another friend joined us, his plan being to ride the ~150 miles between Decorah and Iowa City. We made an unexpected pee stop at a gas station, and the gas station worker asked us so many questions! He asked if he could take our picture, and take selfies with us, so he could send them back to friends and family in India. It was so much fun! We rolled on through Iowa, dodging more traffic as the rest of the world awoke. We hit a small town around mile 65 and rolled through. I looked all around and thought — wait a minute, there was supposed to be a gas station here?! We circled back and discovered it was closed. The group mentioned that maybe we should just keep rolling, but I was completely out of water. I needed something badly — it was a hot, humid day and I didn’t want to get behind on hydration. I saw a bar and decided I’d take the plunge and head in. When I entered the bar, three groups of men sitting around circular tables all swung their heads around to stare. I timidly approached the bar, trying to get the waitress’s attention. She didn’t turn after about a minute, so I slunk to the bathroom. I took care of business, refilled my Camelbak, and walked back out. The other three cyclists were standing around the inside of the bar, one munching on a donut. I asked – where did you get that donut?! and was told “well, it’s Kenny’s birthday!” “What! ?” “It’s Kenny’s birthday, he said I could have one.” I looked around confused, and slid some cash towards the waitress. “This is for using your bathroom. I don’t need to buy anything, but I feel like I should pay.” She shrugged and suggested I didn’t need to give her money, but offered me a free donut. It was then that I learned that the large crowd of men were gathered for Kenny’s birthday, and they were graciously offering free donuts to us cyclists. I ate what was one of the best donuts of my life due to the circumstances, and we chatted with the men for a bit. We told them about our adventure and they said we were a little crazy but wished us well anyway. We headed back onto the road and the headwind picked up. We still weren’t doing much drafting, instead riding sporadically along the route. We’d draft briefly, then someone would surge and others wouldn’t want to match the effort, so it was a jerky affair. We eventually settled into biking along individually, occasionally rolling up to another rider and chatting for a bit, before settling back into our own paces. So many gorgeous sights, the pictures don’t do the ride justice! At mile 95 we rolled past another gas station, and someone asked if we could make an unplanned stop. Sure, I said — today wasn’t completely about pace and riding fast, because we also wanted to live through the ride and be happy. Everyone ate, and I chugged multiple containers of fluids (juice, milk, soda..) — I couldn’t believe how thirsty I was getting even though I was sucking off of my Camelbak continuously. Our hanger and dehydration were abated by the stop, and it was outside of the gas station that we formulated our drafting plan. We decided that drafting was the way to go, but we needed a better approach. We decided we would form a single width paceline, with each person pulling about 2 minutes. The person at the front could pull longer if they wished as long as they weren’t slowing too much. Each person could pull at their preferred pace as long as they didn’t drop the drafters. Someone asked “What if I want to go faster?” and I said “Don’t. Just take longer pulls to wear yourself out. And if you go too fast, we’ll tell you or just let you drop us — we aren’t chasing.” Our plan worked fairly well, allowing us to draft on the windy flat sections. The headwind was stronger than anticipated and it made for a hard ride. There were quite a few hilly sections where we weren’t able to draft well, but we did our best. Our next pit stop was north of Cedar Rapids. We knew we were heading into city traffic just before dinner time, and we didn’t want to be riding poorly because we were hungry. Each one of us comedically went back to the cash register multiple times. We’d eat a snack, still feel hungry or thirsty, and go back to wandering the gas station aisles looking for something else. Leah’s 387th trip to the register at the gas station! After our gas station pit stop we were supposed to meet another cyclist on the north side of CR to help us navigate the bike paths. We had decided to route ourselves through the center of the city to save miles and to avoid vehicles for a portion of our trip. We were so excited to see him riding towards us, and finally I could turn my brain off for a few miles as the “ride leader” and blindly follow someone else around who knew the area well. 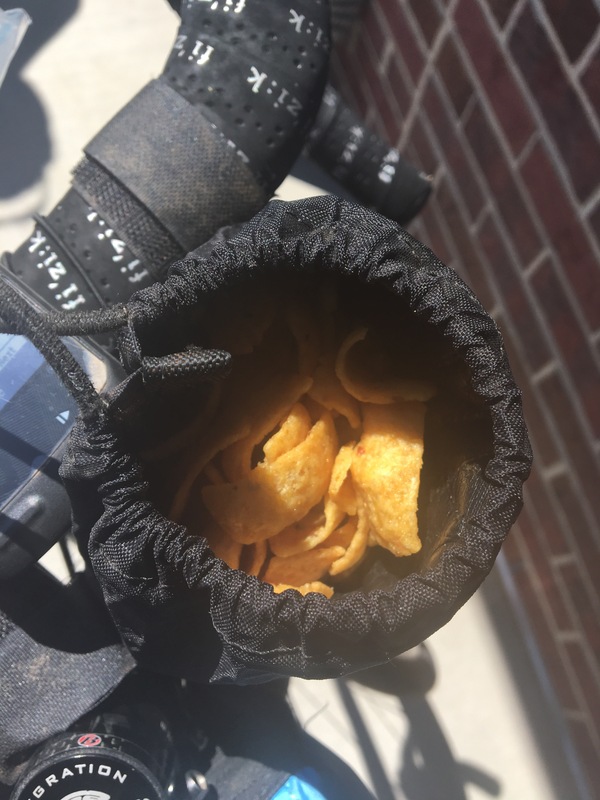 I stumbled upon a new ultracycling food combination that was AMAZING to me — fritos and peanut butter M&Ms in my feed bag! We rode through Cedar Rapids and on to North Liberty. Our other friend had to go, but first gave us modified directions to get us through to the south side of Iowa City. Something on the front end of Leah’s wheel had been creaking since the start of the ride, so I called ahead to my boyfriend in southern Iowa City and asked if he could look at it when we arrived. I knew I was in trouble when even salty McDonalds food didn’t taste good. As we sat at a stop light in Iowa City another cyclist rolled up on my right. I glanced over and was shocked to see another friend! He had mentioned joining us but hadn’t said where or when, and it was a total shock. We pushed on to another gas station and McDonalds, then headed to my boyfriend’s mom’s house to have Leah’s bike looked at. The verdict? A cracked hub. Wheels, tubes, and tires were swapped around as we cyclists lounged about on the floor and ate. I think we lost about an hour and a half at this stop. We peeled ourselves off of the floor and got ready to roll out again, and I realized that I was very, very dizzy and a little incoherent at this point. Apparently I hadn’t done a good enough job with hydration and i was suffering for it. I made it a point to tell my boyfriend that he was NOT allowed to come pick me up or let me quit unless BOTH Leah and Pamela agreed. I had no reason not to finish the ride at this point, and I was afraid I’d ask for the easy bail out option if it was available. Aero fatbike as seen in the wild in the middle of Iowa. We headed out of the city and I was shocked at how dizzy I remained. I had chugged a bunch of liquids and had taken many electrolyte tablets throughout the day, but I was still behind. I could feel all the liquids sloshing around in my stomach. My throat was parched and so I occasionally took sips of water, but they’d come right back up. Eventually I resorted to swishing water in my mouth and spitting it right back out. 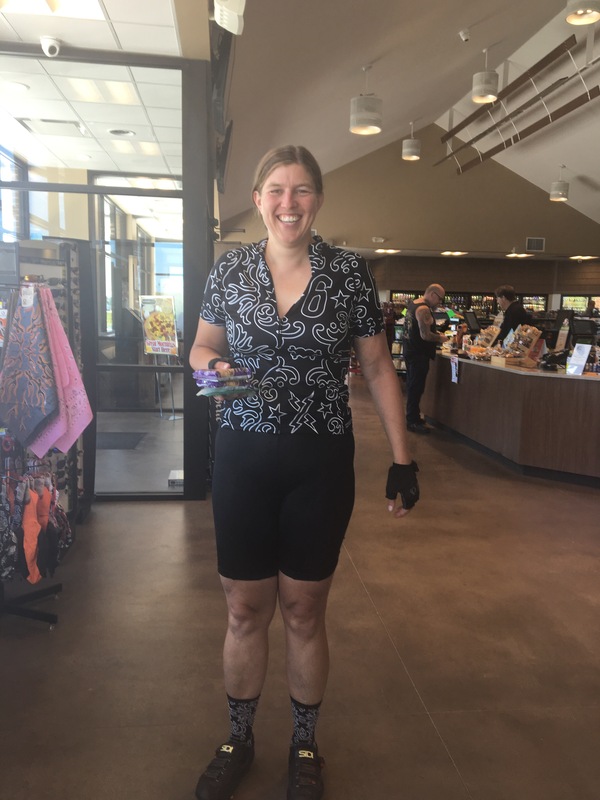 The last 60 miles were a little rough at times, and other times I felt exhilarated and darted up hills, getting out of the saddle to work different muscles. Our group was often separated and segmented, as we lacked energy to focus on staying together. I grabbed a wheel whenever I could. By this point, my boyfriend was in the area with his vehicle, rolling by occasionally to check on us and watch over us. It was after midnight and I had a fear of drunk drivers, so it was nice to have another set of eyes watching the occasional cars that crossed our paths. I fell off the back of the pack but kept them in sight. I was mentally shot and would rather expend additional energy not drafting than have to pay attention and not bump wheels with someone. Suddenly, the battery went out on my light. Crap. I had given my framebag to my boyfriend to carry in the follow car, as it had been chafing the heck out of my legs, which were now raw and a little bloody. I saw headlights in the distance and hoped it was him. I was in luck! He rolled up and in a flat voice said “what do you want?” I think he fully expected me to start petitioning him to throw me in the vehicle and drive me to Missouri. Instead, I explained that I just needed my frame bag for a second and I’d be on my way. He handed me the bag, I got my spare battery out, and off I went. I told him to not follow me too closely as I was still weaving a bit, but other than that I was good! I remained in a low energy state for the remainder of the ride with about 10 miles to go. The girls surged with the prospect of being done, but I was in a low energy point. They slowed to allow us other two to catch up and we rolled into Missouri together, riding four across the road with our follow car nearby. We stopped to take pictures next to the Missouri sign. Someone wanted us to go in the ditch to be closer to the sign and I said “No way, there’s probably wild parsnip in there!” We settled with gleeful pictures on the side of the road with the sign illuminated behind us. I was a little delerious, happy, and in denial of the feat I had just accomplished. 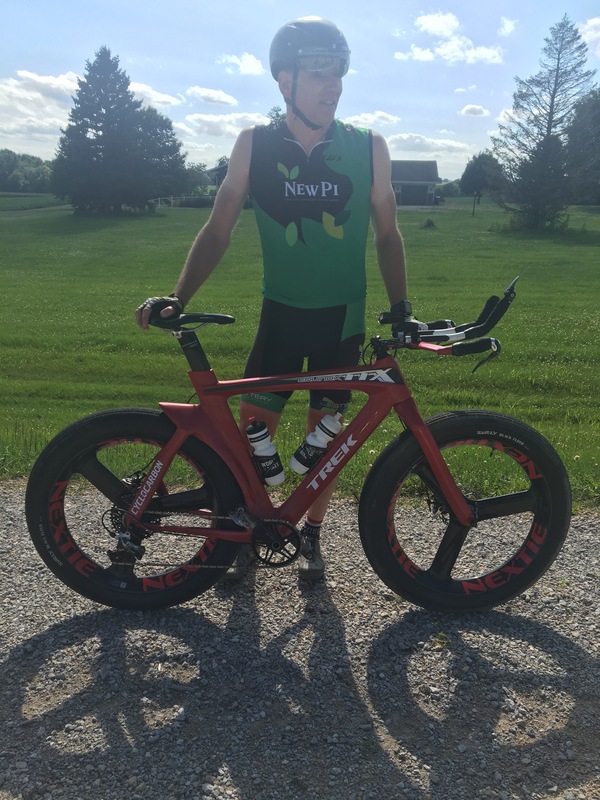 I had ridden from the northern to southern border of Iowa in well under 24 hours (somewhere near 21 hours of total time, with 16 hours of rolling time per Strava). It’s been a week and I am itching to do another stupid long ride and go explore. I’d call the whole experience a major success! So happy to be done! The humidity was high, can you tell! ?